The Top Hinge optical system is more compact, but offers the same high quality optical system. Available in black or green.The highly tactile, performance rubber armour has been designed to allow for comfort, yet provide adequate grip.The Sapphire® ED is supplied with a comfort neck strap and a genuine leather hard case.Available in black or green. 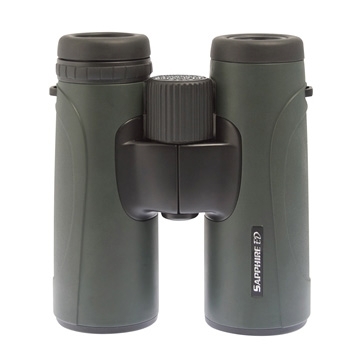 Sapphire® ED, a step ahead in binocular design. Super optics well balanced and not too heavy. Good in low light too. Quality feel and look. Leather carry case very classy. Great value binocular.